We always have a cooler full of fresh flowers so you can Pick Your Favorite Ready to Go! Sure, we offer terrific discounts on our website (like the ones you see here on the home page) and we love talking to customers on the phone and catching up on old times. But the joy of being a real, local flower shop is that people can actually Come By and Pick Your Favorite Ready to Go directly from our cooler! 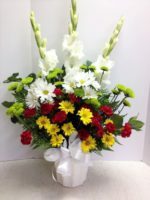 We usually have at least a dozen fresh floral arrangements in the cooler, each made individually by Pamela or Tina. They are custom designed and unique, just like you! 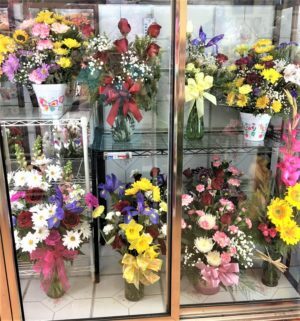 In the heat of the summer, you’re welcome to spend a minute or two in the walk-in cooler and enjoy not only the 35 degree temperature but also the fragrance and beauty of the fresh flowers! You’ll want to come back every day! 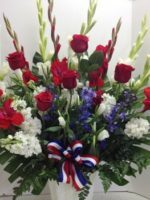 We’re happy to have you call or click, but we know sometimes you want to Come By and, well, stop and smell the roses! 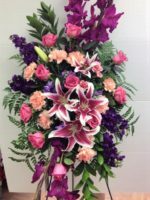 Fresh Flowers from Roadrunner Florist! Unique. Stunning. Beautiful! Come’on by and see!